An Aspen honeymoon is perfect for winter-loving couples, but it's also a beautiful destination in the warmer months. There's so much to do whether you're looking for adventure or relaxation—or a bit of both. An Aspen honeymoon is an ideal destination for winter-loving couples. The Colorado town is famous for its expansive mountainous terrain where skiers and snowboarders can hit the powder for an action packed getaway. Couples can spend the day out on the slopes and then treat themselves to a good meal at one of Aspen’s top rated restaurants. Or, if you’re looking for a relaxing, we definitely suggest checking out one of Apsen’s aromatherapy spas for a couple's massage during your vacation. While Aspen does live up to this lofty reputation with gorgeous mountains and a variety of winter sports, it’s also beautiful in the warmer months. During the summer, Aspen honeymooners can enjoy leisurely and challenging hikes, exciting live music and festivals, and scenic helicopter tours. So, if you’re looking for a destination that’s filled with outdoor activities and gorgeous scenery, then an Aspen honeymoon is the perfect choice for your romantic getaway. An Aspen honeymoon offers lots of options for any couple looking for a picturesque destination. If you’re looking to take your Aspen honeymoon in the winter with fresh, sparkling snow, head there between December and early March. For summer honeymooners, go between June and August for great hiking weather and relaxing around town. 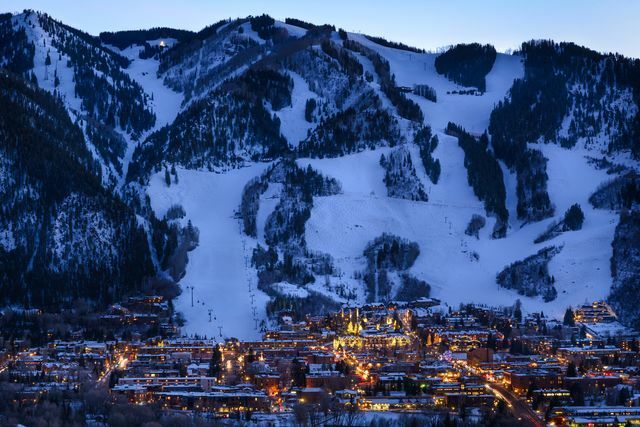 Skiing and Snowboarding: Hit the slopes for a fun-filled Aspen honeymoon. Hiking: Visit in the summer to experience Aspen’s rich trail networks. Camping: Couples who want to experience the outdoors during their Aspen honeymoon should definitely check out a campground for a few nights. Spas: Aspen is home to many spas to make your Aspen honeymoon as relaxing as possible. Shopping: Aspen’s streets are lined with adorable shops and restaurants. Wheeler Opera House: An historic opera house in the heart of the small town. Nature Sanctuaries: Great for photographers and couples wanting to get closer to nature. Art Museum: Although it may be surprising, Aspen has its own art museum. Gondola: Perfect for getting close to Aspen’s breathtaking views. Rafting: Join a guided excursion through rough water on a raft. Ashcroft Ghost Town: An eerie abandoned town just outside of Aspen. Horseback Riding Experience: Aspen’s trails on 4 feet instead of 2. He wants the mountains, I want the ocean. I'm looking for recommendations on honeymoon spots in either Colorado (or other mountainous areas) or Florida (or other beachy places) Thanks!